The first week of fall has fell hard. The weather has been hovering around 90 degrees. We have an overabundance of tomato's to harvest. One of our house specialities is making spaghetti sauce. We bought a large commercial size food mill at a garage sale. It is a wonderful tool to separate seeds and skins from the tomato. 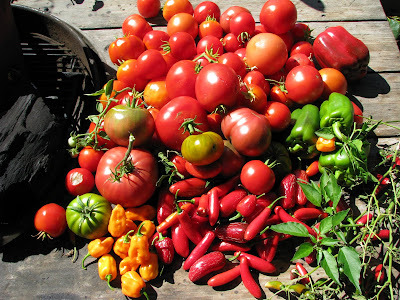 We add home grown herbs and peppers to our seedless, skinless pot of tomatoes. Mushrooms , Dakota Sausage, and some baconburger meat rounds off this pot of red gold. It is simmered for a while. The house smells great. We have our fill and freeze the rest. 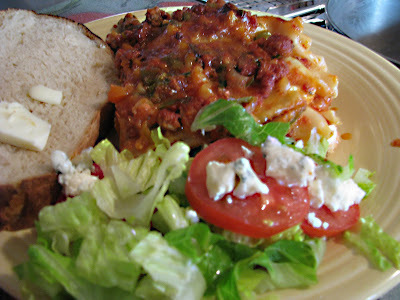 One use of this yummy sauce is to make Lasagna. The only problem is turning the oven on will make the house hotter than necessary. No worries! The Weber barbeque will come to the rescue. 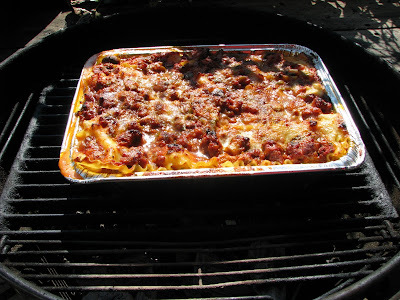 I will make the Lasagna in a disposable pan and cook it with an indirect heat. The perfect Chilebrown twist. 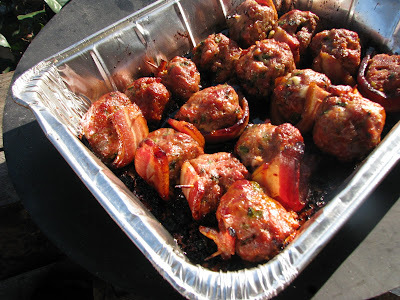 Take a disposable foil pan and lightly oil. Layer noodles to cover bottom. Take one cup of sauce and cover noodles. Add 1/3 mozzarella and ricotta cheese. Layer another round of noodles sauce and cheese. Repeat and cover top with more sauce and Parmesan.Cover with foil. 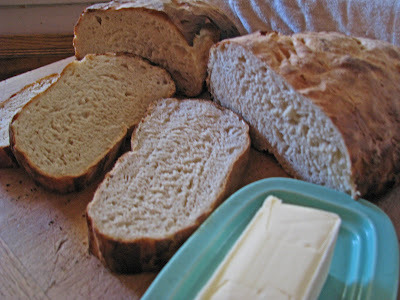 Bake for 1 hour at 375 or until cheese is bubbly and top is browned. Leave foil on for first 45 minutes and remove to facilitate browning. 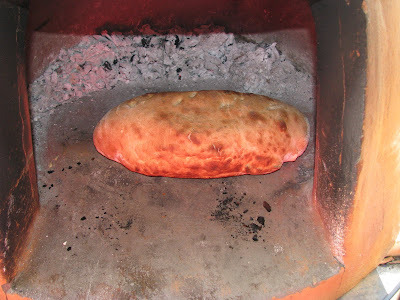 We threw in some bread cooked on the wood fired oven. What a feast! The house stayed cool and We ate like Royalty! Is horseradish a plant, vegetable, spice or the seed from hel? I sort of think it is the latter. Horseradish plants have the unique quality of taking over your yard and the neighbors too . I learned my lesson at a rental property many moons ago. I have horseradish growing in the corner of my property. Every once in a while I have to take a shovel, blow torch and a bible to contain this potent root. Horseradish is a spicy, hot plant. You can put the leaves in your salad, if you are brave. The roots are what we are looking forward too. The roots can be ground into a potent concocton. You only need to add salt and acid. The acid can be wine or vinegar. You can tame the flame with sugar or honey. Let's just go for the gusto. Dig up your roots. Clean the beezlebob till white and pure. Dice into cubes. Add to your food processor with cup of vinegar or a cup of wine. Pulse to thick puree. Add salt to taste. Add water if too thick. Be careful taking the lid off the food processor. If you are using fresh horseradish you may be in for a blast of spicy, hot, overwhelming fumes. They may cause spontaneous human weightlessness and gagging for air. 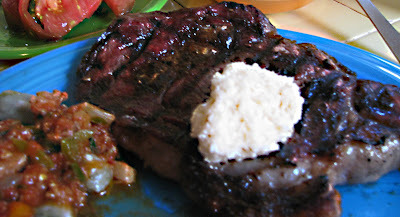 Tonight we are having some Rib Eye Steaks with a dollop of freshly made horseradish sauce. Oh my is this spicy. It is a good thing we have malfatti with home made sauce to calm the storm! When life gives you tomato's, make salsa. 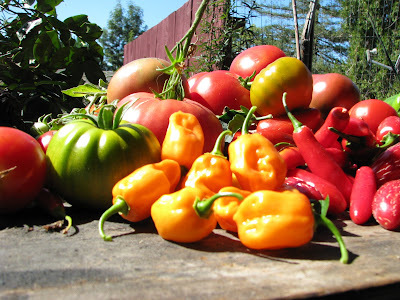 It is that time of year that the tomato and pepper crop at the Mad Meat Genius farm is over growing with ripe produce. It is a cornucopia of colors and flavors. 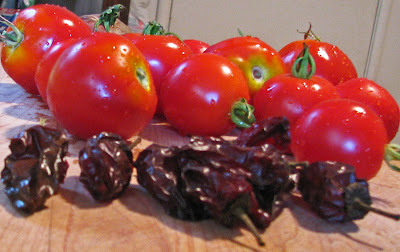 It is time to make salsa. We are making Pico de Gallo and a chipotle salsa today. 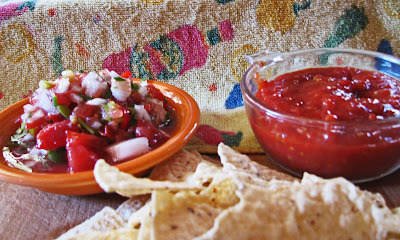 Pico de Gallo is an all purpose salsa. It just makes everything taste better. My favorite, is to make a cheese quesadilla and plop a dollop of pico de gallo on top. Simple and delicious! I will refer you to a past post for a recipe. 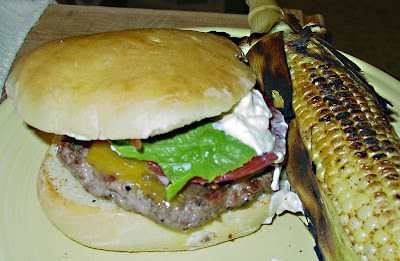 Chipotle Salsa is a smoky, hot, sweet and ketchup like type of salsa. The chipotle pepper has so many flavor nuances. I am using home smoked chipotle, but canned chipotle in adobo is readily found at your local store. 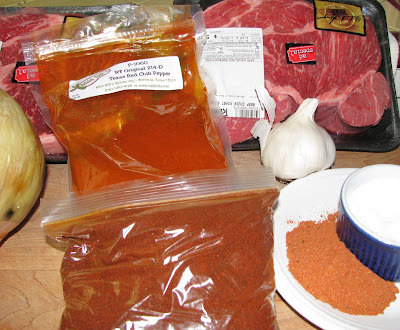 This sauce is simmered for a while and then pureed in a blender. Place all ingredients in a saute pan. Bring to a simmer. Simmer for 20 minutes. 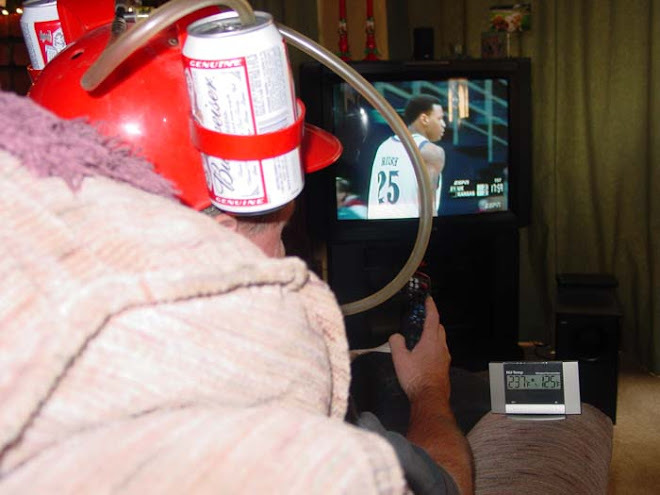 Let cool and place into a blender. Puree all ingredients. Add a little water if mixture is to thick. That's all she wrote. Another simple but very satisfying salsa. Take some tortilla chips and enjoy the summer bounty!!!!!!! Chili Colorado is Ms. Goofy's favorite dish to order in Mexican restaurants. 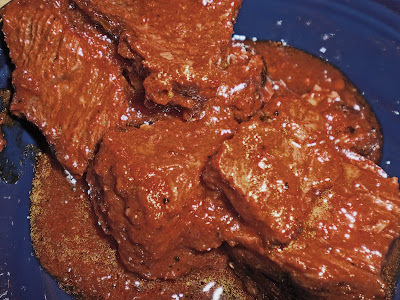 She had a craving for this spicy stew of red chile pepper and beef cubes. Chilebrown will come to her rescue. 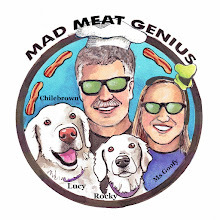 There will be the usual Mad Meat Genius flairs. 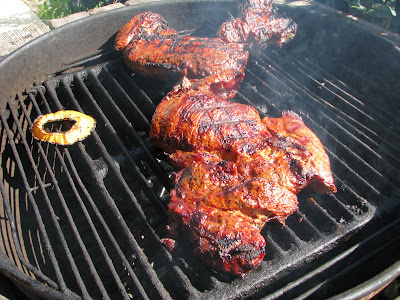 The meat will be grilled on a Mesquite fire. Traditional chili colorado does not have tomatoes. 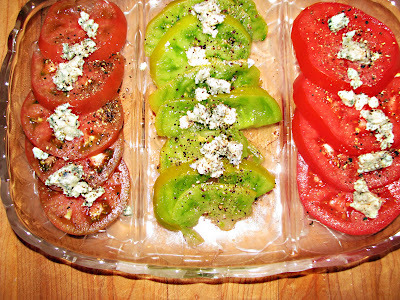 Today's dish will have some beautiful vine ripe tomatoes from the garden. These red orbs will be grilled with some onion and garlic. This will heighten and enhance the sugars by its kiss of fire. All this will be combined with fresh chile powder and simmered slowly for an hour. I can taste it all ready. We served this over rice. The meat was very tender. The chili stew warmed our soul. This is comfort food all the way to the moon Alice. This chili colorado taste even better the next day. We are looking forward to tomorrows today. We are having breakfast with Aaron McCargo Jr. and 'Wright Brand Bacon'. 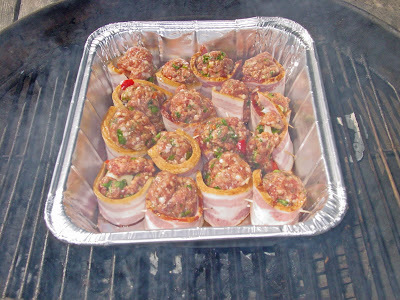 Big Daddy is coming to our house and showing us how to make bacon egg cheese cups. Bacon, egg and cheese is a 'take the prize' combination. It is the breakfast of America. This is a winning way to prepare this combination. We will watch Big Daddy do his business and then we will get a Chilebrown version. Let's get cooking! Big Daddy made some tasty treats. The Mad Meat Genius kitchen will have to give it a Chilebrown spin. We are basically going to use the same ingredients. 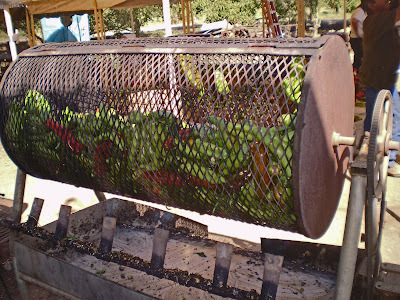 Instead of mushrooms, some green roasted California Long Hots will be used. 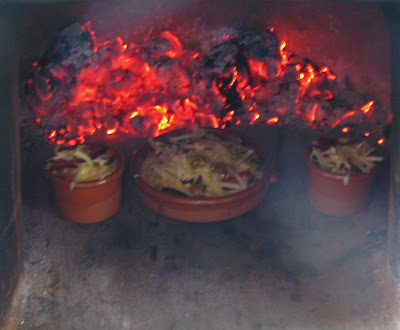 We will cook it in a oven, an almond wood fueled oven that is. Some terracotta dishes will be used instead of a muffin pan. We are taking our breakfast serious. Breakfast has never tasted so good. 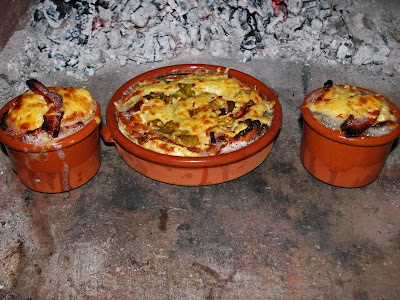 Bacon, egg cheese cups cooked in a wood fired oven hit the spot. It takes a little while to fire up the beehive oven. Ms. Goofy will have to get up a little earlier next weekend. Well, at least I can dream. These are not Anaheim' peppers. They are not New Mexican. They are not Nu-Mex Jim's. These are California Long Hot peppers. They do not claim to be anything else. Joe's Chili Peppers located in Stockton California sells the real deal. 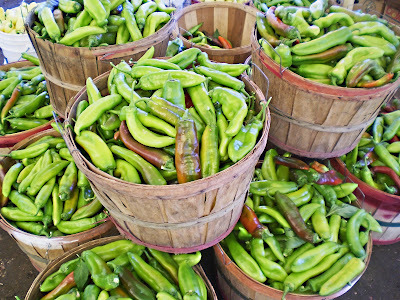 These are long green chile's ready for roasting, stuffing and just plain enjoying. You can buy peppers picked in the morning and roasted right in front of your drooling, eye watering pepper hound mug. 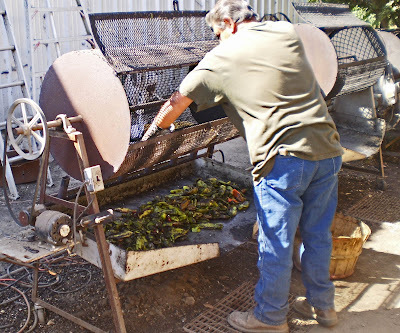 Ms. Goofy and I make a pilgrimage every other year and buy a 50 pound sack of 'green chile nirvana'. It is very impressive when you see 5 roasters fired up. There is a blast of propane fueled rocket noises. There is sputtering and flaming that makes you wonder if you are going to launch into outer space. We may find out that the moon is made of green chile. "Hey, the World was not flat". 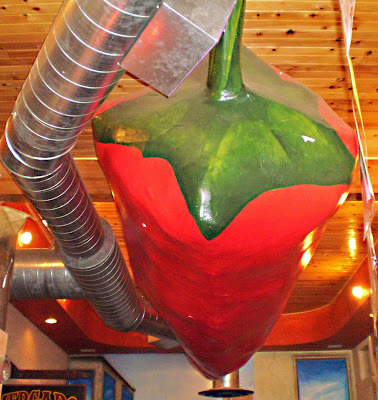 The smell of roasted pepper's can be smelled 5 miles away. (Take that:"Spare The Air", Bureaucrats}. 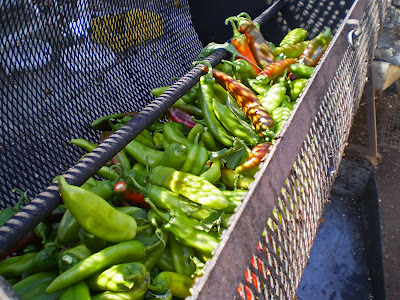 Our 50 pound sack of peppers is roasted in less than 5 minutes. Our expert roaster lets them cool down for another 15 minutes. He then puts them in a large plastic and paper sack. Stockton is two hours away from our Barbeque Palace. When we got home they were still smoking hot. 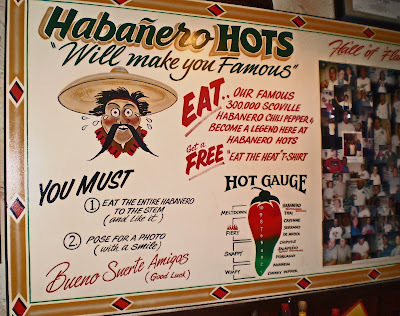 Oh, by the by, we stopped on the way home at 'Habanero Hots'. Ms. Goofy and I were parched from all that chile smoke. 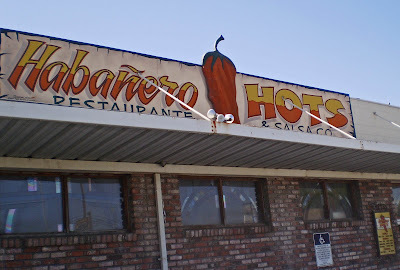 If you are a Chilehead, could you, would you pass by a restaurant called 'Habanero Hots'. Ms. Goofy was driving by her 'Chili/Meat' navigational system which steered us right into the parking lot. This place looked like a smoking hot hangout. The first thing we noticed was the Habanero challenge. Ms. Goofy was not up to the contest and I had to be a designated back seat driver. 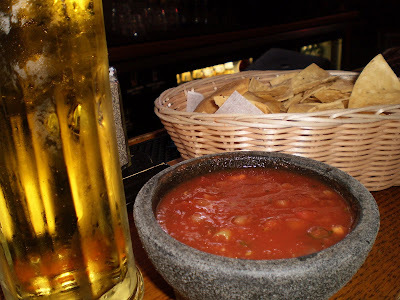 We did have a liquid refreshment and some Habanero salsa. The salsa had a pleasantly medium hot kick. 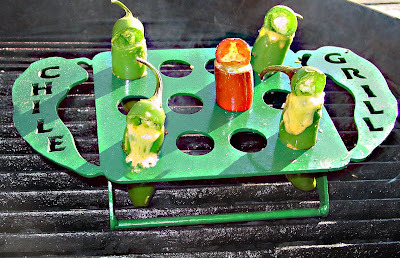 Not for the chile-challenged, but nice for the chilehead nation. We arrived home and let our chile cool down. It was one hot day! 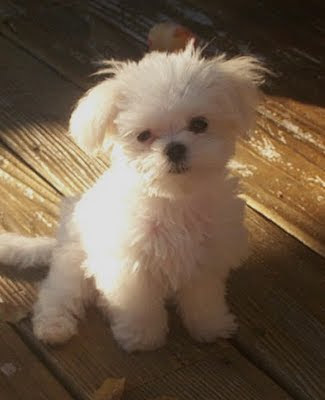 Later on, after Ms. Goofy was released from the couch, we placed our chile in different size freezer bags. These peppers freeze so well. Take a bag out of the ice cave and let it partially thaw. The blistered skin will fall away with a gentle wiping. This 50 pound sack will last us 2 years unless we give too much away. 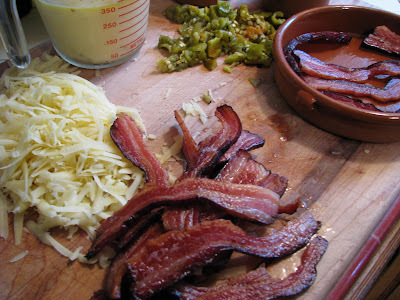 This green chile has so many uses and so little time. So little time today to enjoy California Long Hots!!!!!! 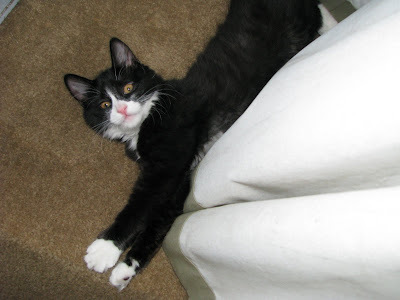 Oh yeah, Trixe Norton has taken over the household. We have purchased a huge jungle jim that she climbs over constantly. Well, unless she is climbing over poor Mojo and Oscar. Our kitty has become the Queen of the Roost. She goes wherever she wants. She sometimes terrorises the Doggies. She is only playing, but our Golden Lap Dogs have been very patient. Sometimes Mojo will play with the Queen Trixie, unless he is using her as an eye shade. Clear Lake California at Konicti Vists was the place to be for the Killer barbeque competition this Labor Day weekend.. A Crab pot full of competitors battled it out for money and bragging rights. Why a Crab Pot full?. Captain Pill Harris was in the house. He did not actually judge, but his two sons picked up the crustacean slack. 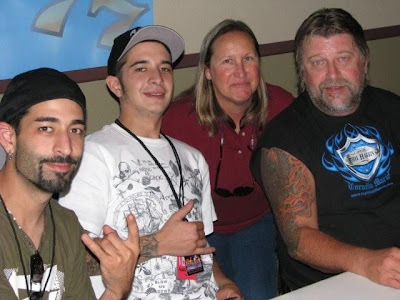 His two sons Jake and Joshs were almost to Kool for school. They have reached celebrity status in a short amount of time. Josh and Jake took the CBJ oath with the rest of us . I think Jake did not know the seriousness of his job until Josh reeled him in like a big ole salmon/crab/goofball. Ms. Goofy and I will be judging the "Smoke On The Water' barbeque contest this Labor Day weekend at beautiful Clear Lake California. It is right at the waters edge at the Konocti Vista Casino. There will be some celebrity judging at this contest. 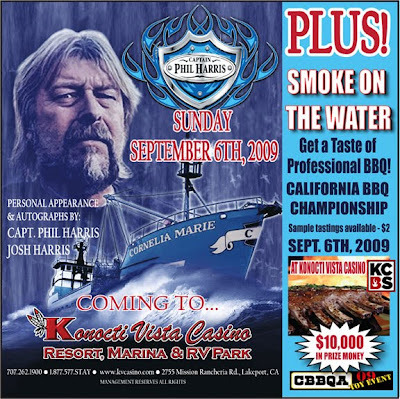 Besides Ms. Goofy and Chilebrown, Captain Phil Harris from the 'Deadliest Catch' will be judging. I have no idea who Phil Harris is, but, Ms. Goofy has watched every episode, twice, and says she is looking forward to meeting him. (I thought he was that guy who sang the smoking song . Phil Harris singing smoke song ). If you are at Clear Lake and happin to stop by the contest. Be sure to say Hello!. We will be the ones with the smile and barbeque sauces on our face. 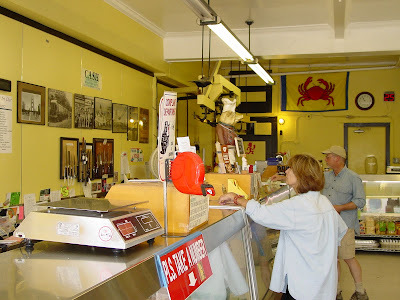 Our Meat Adventure today takes us to 'Drewes Bros Meats' located in San Francisco California. 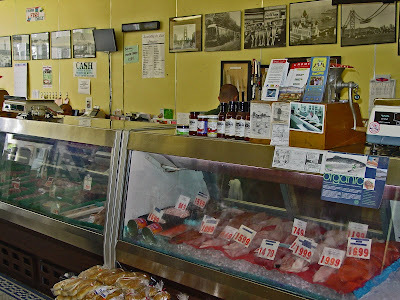 This meat market has been open since 1889 and claims to be the oldest operating butcher shop in California. Ms. Goofy and I decided that Drewes was worthy of an adventure. We wanted to experience this living history of meat purveyance. 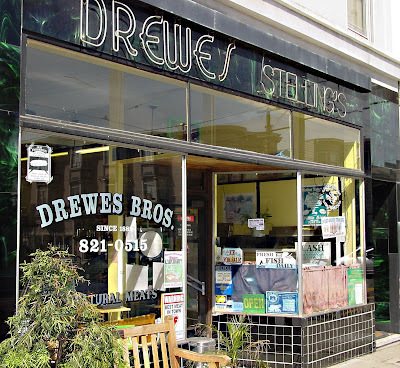 Drewes Bros. is located in the Noe Valley district of the City. Noe Valley was once a working class neighborhood. It has been magically transformed into a 'Yuppie' oasis for young urban professionals. Drewes Bros caters to this tony neighborhood. When you first walk into Drewes, a hodgepodge disarray is the predominate decorating theme. The walls are an eclectic collection of pictures, art and clutter. Drewes runs a mailbox service that is located in a corner. There are a couple of shelves with Sundry Items. A steel beam in the ceiling runs from the meat displays to the back walk-in. It is an impressive piece of steel. 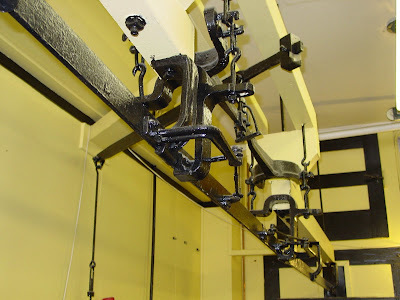 At one time, meat carcasses were hung and guided a long these tracks. Drewes has a very impressive line up of meats. They have all top shelf meat providers. 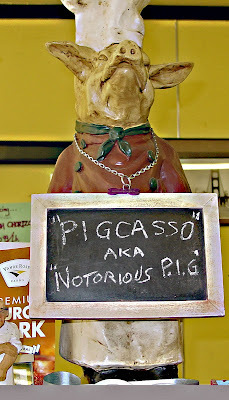 Niman Ranch, Angus Meyer, Natural Hill, Petaluma Farms and the famous Rosie Organic Chicken are some of the suppliers. 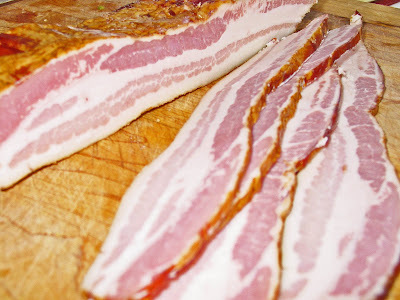 Another Drewes claim is: " All of our products (except for some sausages) are all natural, free-range, with absolutely no hormones, antibiotics or preservatives". I am feeling good all ready. You will pay top dollars for these superstars of the meat world. There may also be a surcharge for the privilege of shopping in Noe Valley. The people that worked at Drewes were very friendly. Our meat adventure ended with a purchase of some smoked ham hocks and of course some double smoked bacon from Schaller & Weber We have just experienced living meat history.